Betsan, the organiser of Stitchlinks, recently contacted me with about research being conducted into the healing powers of knitting (something I alluded to here). How great that some people are attempting to provide some robust answers to this! She says "We’re collecting a large volume of anecdotal evidence via an online questionnaire and need to muster the help of as many knitters, crocheters and cross stitchers as possible. We need to collect thousands of stories which will then be analysed and presented to experts in a number of fields of medicine and psychology. 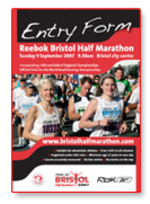 Only first names will be used in the final documentation so no contact details will be passed on to anyone." 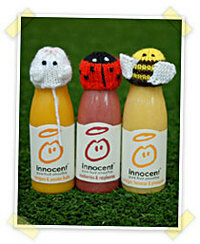 I love the makers of Innocent drinks! I love the little bottles with their witty little blurbs, the yummy flavours and the fact the fact they started with so little and now have a squillion-pound turnover (but, given the price of the shakes, it's not that surprising, is it?!). But, best of all, I love their Supergran campaign. Last year more than 220,000 hats went out to see the world - with 50p donated by Innocent for every little hat - that's a lot of money! 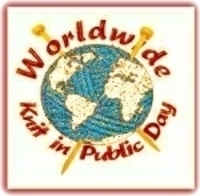 It is World Wide Knit in Public Day on Saturday 9th June! As if we needed more of an excuse..! I've missed the deadline to sign up Bath (dammit) but, that day, I will be sitting in a sunny public place knitting merrily. My Oxford knitting buddy, Rachel, will be visiting: if anyone else fancies joining us please drop me an email! A friend who knows a lot about all-things-sporty watched me run and commented 'try to run with your knees pointing straight ahead'. Eh? How am I not doing that?! Oh dear: says it all really. Thought I should share this amazing website called Run London. Although it looks Londoncentric this is just an illusion: it seems to cover the whole of the UK. If you put the first part of your postcode into the start point search it will take you to a zoomable map of your area. Then start plotting your route and click on the roads you wish to use to get a distance of that route. I'm only able to run for an hour at the moment and need to get up to twice that over the next couple of months...ugh. And this allows me to work out landmarks that I need to reach in order to build up slowly...hurray! Less measuring roads in the A-Z map with a piece of string, using map-scales and calculators, with a pencil behind my ear...and more merry clicking from my sofa whilst eating chocolate. Excellent. Sadly, though, it appears that my regular running route is only 2.6 miles and I'd been telling myself it was more like 4 miles. Sometimes not knowing the truth is easier to bear...dammit. Any knitted in memory of loved ones will be worn by Dorret Conway (of Knit Knack) on June 17th Edinburgh when she walks the Edinburgh Moonwalk. Send your flowers to: Noni Flower Appeal, PO Box 1052, Preston, Lancashire, UK PR1 0XS. I'm off to buy the pattern...and knit like a lunatic. POSTSCRIPT 17/05/07: Get Knitted at Bristol is now selling the flower pattern online here and in the store. 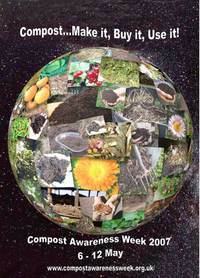 How great is it to throw things in a heap and leave them...and have them turn into something useful?